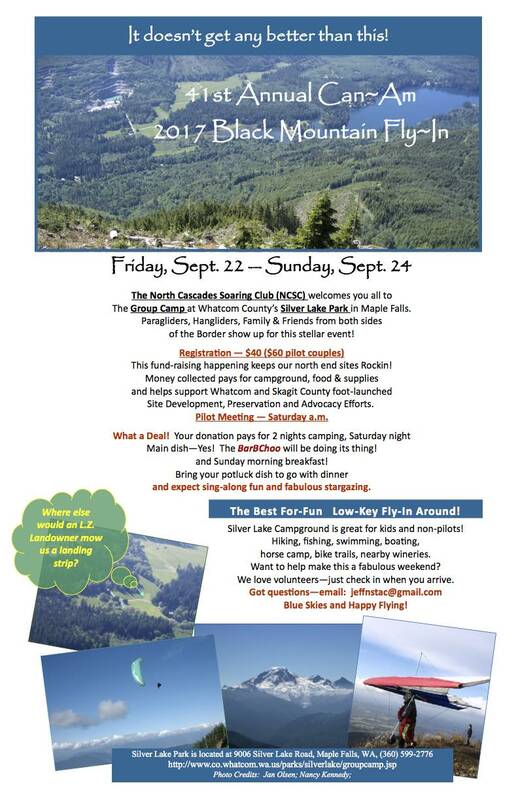 The North Cascades Soaring Club (NCSC) welcomes you all to The Group Camp at Whatcom County’s Silver Lake Park in Maple Falls. Paragliders, hang gliders, family & friends from both sides of the border will show up for this stellar event. This fundraising keeps our north end sites Rocking! Money collected pays for campground, food & supplies and helps support Whatcom and Skagit County foot launched site development, preservation and advocacy efforts. Your donation pays for 2 nights camping, Saturday night Main dish. The BarBChoo will be doing its thing! and Sunday morning breakfast! Bring your potluck dish to go with dinner and expect sing – along fun and fabulous stargazing.